Heritage 13-Star Flag Kit - Made in the U.S.A.
Home > AMERICANA and Antiqued Flag Decor > The Heritage Series from Valley Forge > Heritage 13-Star Flag Kit - Made in the U.S.A. 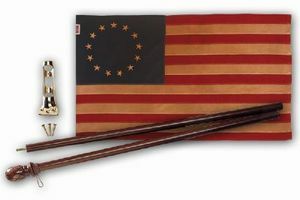 This boxed Heritage flag kit comes complete with a 2 1/2'x4' sewn, sleeved, antique cotton 13-star flag, 5' 2-piece mahogany stained wood pole and 1-position brass bracket. Flag is 100% made in the U.S.A.